Please have your name and/or order # on the FFL when sending. .308 Short action right hand, right eject. Kelblys Atlas Tactical is a Remington semi-clone action, side bolt release, trigger hanger, Black Nitride finish, a fluted bolt, side bolt stop, 20 MOA anodized picatinny rail, a dual pin recoil lug, and a tactical bolt knob. 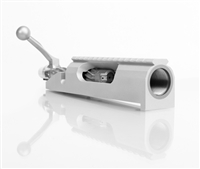 One of the key features of this action is the TG ejector, it is a mechanical ejector that does not put any chamber pressure on the round. It is also a “never fail” setup, meaning that there are no springs to get gummed up and stop working. There is little modification necessary to use a Remington 700/40x stock or chassis. Uses the Accuracy International center feed magazines. Long, mag bolt face, right hand, right eject.